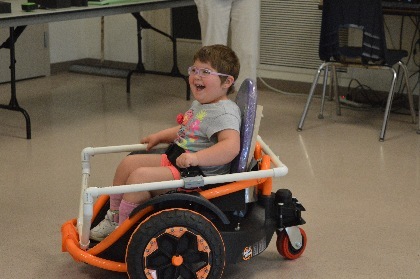 The story of Miley and her new wheels is certainly one to warm the heart. In their coverage of her final fitting at Champlain Valley Union High School, the Burlington Free Press called it the “warm and fuzzy story of the day.” Miley’s story is such a feel-good tale that it was even featured on the America Strong segment on World News Tonight with David Muir. Videos of individuals reaching a new level of independence and inclusion within their communities are viewed millions of times on social networking sites like Twitter and Facebook. While we scroll, these stories give us a few moments of bright smiles and happy tears, but seldom do they explore the work that goes into making these viral videos a reality. The old saying that it “takes a village” rings true upon inspecting the amount of people and planning involved for Miley to move independently. Part of that village included support from the Vermont Interdisciplinary Team, better known as the I-Team. The I-Team is the Center on Disability and Community Inclusion’s largest project and helps support teams of family members, educators, and professionals work with students so that they can experience and access inclusive education. These acts are seldom caught on camera, but the services the I-Team provides for children and young adults can feel like miracles. The I-Team is comprised of professionals with an array of backgrounds (family consultants, educational consultants, occupational and physical therapists, speech-language pathologists, just to name a few) who assist local teams of families, educators, and other service providers in the delivery of quality educational services to students. There is no “one-size-fits-all” standard for inclusive education, so a team of professionals come together to make plans for and measurements of educational success. Goals are mapped out by the student, families, and other professionals who work with the student. In Miley’s case, her team used the Student, Environment, Tasks, and Tools (SETT) framework originally created by Joy Zabala, Ed.D. to consider what sort of Assistive Technology would help Miley be successful. 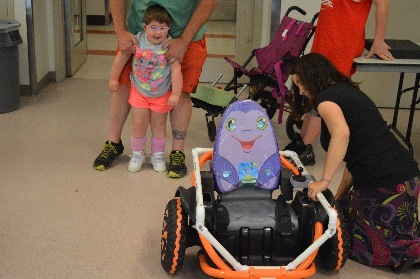 Through this process, it was determined Miley would benefit from independent mobility, but not necessarily a power wheelchair. Miley celebrated her 4th birthday in June. Research indicates that finding methods for independent mobility at young ages is linked to children with disabilities experiencing success with other skills like language, socialization, and other motor functions. 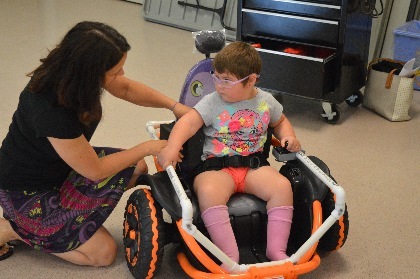 Even with this understanding, there are many barriers to providing young children with devices, especially power wheelchairs, that can grant them independent mobility. Among these barriers, the biggest tends to be the expense and timeline for necessary renovations to make homes and vehicles wheelchair accessible. With a need for some sort of power mobility, but with the hopes that Miley could still hold out a little longer before getting a power wheelchair, the I-Team needed to get creative. Deborah Sharpe and Tamra Yandow, two of the I-Team’s Consultants, reached out to another part of our village. They sent out letters to Robotics and Engineering departments at a handful of schools, to which Central Valley Union High School responded in earnest. The afternoon of June 12, 2017 was Miley’s final fitting at CVU. The hallways were mostly quiet as most students were off enjoying the sunny day, yet some machinery could still be heard as two faculty members and Willem, a rising senior, made final adjustments to the Power Wheels Wild Thing. The team had found and improved upon Open Source code and plans to adapt the Wild Thing so that it could be controlled by a single joystick, something Miley is capable of maneuvering. The result is an instrument Miley can use to get around the playground and classroom without help from an adult. Miley’s delight and exuberance were caught on camera and shared with hundreds of thousands of people. What Miley, her family, and the I-Team get to see is Miley’s increased independence, self-care, and successes while she learns and plays alongside her peers.